This topic describes how to use the Cloud Migration tool to migrate your server to Alibaba Cloud ECS. Note In this topic, the source server refers to your on-premises server, VM, or cloud host. The steps described in this topic also apply to the migration of other types of servers. If you only want to migrate a database, see Data migration. Create an Alibaba Cloud account. If you want to migrate the source server to an Alibaba Cloud region in the Mainland China area, you need to complete real-name authentication. Ensure that your account balance has at least USD 100. Note The Cloud Migration tool is provided free of charge. However, some Pay-As-You-Go resources are created during a migration, and the creation of these resources incurs a small fee charged to your account. If you want to use a RAM user account, you need to first use your Alibaba Cloud account to grant permissions to the RAM user so that the RAM user has permission to read and write ECS and VPC resources. We recommend that you grant permissions to the RAM account to use the AliyunECSFullAccess policy and AliyunVPCFullAccess policy. For more information, see Permission granting in RAM. Activate the snapshot service in the ECS console. If you use a service provider account, ensure that you can call ECS APIs to order and purchase resources. Ensure that the local time of the source server is the same as the actual time. Otherwise, the error message IllegalTimestamp will occur during a migration. ECS: https://ecs.aliyuncs.com:443. For information about ECS service addresses in other regions, see Endpoints. ECS intermediate instance: port 8080 and port 8703 of Internet IP addresses. When you perform a cloud migration through VPC intranet, the source server accesses private IP addresses. The Rsync database is installed. CentOS: Run the yum install rsync –y command. Ubuntu: Run the apt-get install rsync –y command. Debian: Run the apt-get install rsync –y command. Other platforms: See their respective official websites for installation documentation. Note By default, mainstream servers are installed with the Rsync database. No manual installation is required. The SELinux feature of the source server is disabled. You can run the setenforce 0 command to disable SELinux temporarily, or edit the /etc/selinux/config file to set the field SELINUX=disabled to disable SELinux permanently. Note In most cases, SELinux is disabled only for CentOS and Red Hat. The virtio (KVM) driver is installed. For more information, see Install the virtio driver. Note In most cases, mainstream servers are installed with the virtio (KVM) driver by default. No manual installation is required. The latest version of Grand Unified Bootloader (GRUB) is installed. For earlier versions of operating systems (such as CentOS 5, Red Hat 5, and Debian 7), the GRUB version must be V1.9 or later. For more information, see Update GRUB 1.99 for a Linux server. Note For some operating systems, such as Amazon Linux, the GRUB version must be V2.02 or later. Do not operate the intermediate instance. During a migration, a temporary intermediate instance named INSTANCE_FOR_GOTOALIYUN is created automatically under your Alibaba Cloud account. Do not stop, restart, or release the intermediate instance. After the migration, the intermediate instance is released automatically. Incremental data migration is not allowed. We recommend that you pause such applications as databases and containers, or filter specified data directories before a migration and then synchronize these data directories after the migration. For Windows servers: By default, only data on the C drive (including shared directories attached to the C drive) is migrated as a partition of the system disk. If you want to migrate data on other partitions such as the D drive, see Data disk parameter settings. For Linux servers: By default, data on the subdirectories (including shared directories) under the root directory (/) is migrated as a partition of the system disk. If you want to migrate data on other directories such as /disk1, see Data disk parameter settings. Download and install the Cloud Migration tool. (Optional) Exclude files or directories from migration. Run the Cloud Migration tool. Download the Cloud Migration tool package and decompress it to the source server. Note The Cloud Migration tool is available for Windows and Linux in both the 32-bit and 64-bit versions. i386 refers to the 32-bit version and x86_64 refers to the 64-bit version. You can select a version compatible with the source server. go2aliyun_client.exe The Windows CLI executable file. go2aliyun_gui.exe The Windows GUI executable file. For more information, see Windows GUI of Cloud Migration tool. go2aliyun_client The Linux CLI executable file. user_config.json The configuration file of the migration source and migration destination. Excludes folder The folder in which to add directories to exclude from the migration. client_data The migration data file, which includes such information as the intermediate instance and migration progress. If you are using Windows GUI, you can configure the user_config file on the GUI. For more information, see Windows GUI of Cloud Migration tool. access_id String Yes Your AccessKeyID for accessing Alibaba Cloud APIs. For more information, see Create an AccessKey. When you migrate your server, the Cloud Migration tool requires your AccessKeyID and AccessKeySecret. We recommend that you securely store these credentials and keep them strictly confidential. secret_key String Yes Your AccessKeySecret for accessing Alibaba Cloud APIs. For more information, see Create an AccessKey. region_id String Yes The ID of the Alibaba Cloud region to which your server is migrated, for example, cn-hangzhou (China East 1 (Hangzhou)). For more information, see Region and zones. image_name String Yes Set a name for the image of the source server. The name must be unique in the Alibaba Cloud region. The name is a string of 2 to 128 characters. It must begin with an English or a Chinese character. It can contain A-Z, a-z, Chinese characters, numbers, periods (. ), colons (:), underscores (_), and hyphens (-). system_disk_size Integer No Specify the system disk size. Unit: GiB. Value range: 40 to 500. Note The value must be greater than the space occupied by the system disk on the source server. For example, if the system disk size is 500 GiB and the occupied space is 100 GiB, set this parameter to a value greater than 100 GiB. The value of the platform parameter is case-sensitive. bandwidth_limit Integer No The maximum bandwidth of data transmission. Unit: KB/s. The default value is 0, which indicates that the bandwidth is not limited. data_disks Array No A list of data disks. A maximum of 16 data disks are supported. For more information about specific parameters, see the following table. This parameter can be set to a value (in GiB) required to shrink disk volume. However, it cannot be less than the actual space used by the data disk. data_disk_index Integer No The serial number of a data disk. Value range: 1 to 16.
data_disk_size Integer No The size of a data disk. Unit: GiB. Value range: 20 to 32768. Note The value must be greater than the space occupied by the data disk on the source server. For example, if the source data disk size is 500 GiB and the occupied space is 100 GiB, set this parameter to a value greater than 100 GiB. In Windows, specify a drive letter, such as D:, E:, or F:. In Linux, specify a directory, such as /mnt/disk1, /mnt/disk2, or /mnt/disk3. Note It cannot be the root directory or system directories, such as /bin, /boot, /dev, /etc, /lib, /lib64, /sbin, /usr, or /var. Four scenarios are provided as follows to describe how to edit the user_config.json file. In each scenario, the migration destination of the target server is the Alibaba Cloud region of China East 1 (Hangzhou). Note If the configuration file is lost or is accidentally deleted, you can create another one. Note If you want to exclude a Windows directory, you need to remove the prefix of the directory ( scr_path). In the preceding example, you need to remove D:\. Note If you want to exclude a Linux directory, you need to remove the prefix of the directory ( scr_path). In the preceding example, you need to remove /mnt/disk1. If you use the Windows GUI, in the directory where the Cloud Migration tool is located, run go2aliyun_gui.exe. If you use the Windows CLI, run go2aliyun_client.exe. Note When you run the program, you need to confirm your administrator privileges by clicking OK. Note After you run the Cloud Migration tool, you do not need to perform any other operation. After you run the Cloud Migration tool, it automatically obtains source server information (the number of CPU cores, CPU usage, memory size, memory usage, disk size, and disk usage) and prints the information on the terminal. Additionally, the migration status is also printed on the terminal as a log stream. When the Goto Aliyun Finished! message is displayed, it means that the migration is completed. Log on to the ECS console, and then select the target region to view the generated custom image. Use the custom image to create a Pay-As-You-Go ECS instance or replace the system disk to check whether the custom image runs normally. Note You can use a custom image without data disks to replace the system disk of the instance. Start the target instance. For more information, see How can I check my system after migrating a Windows server? or How can I check my system after migrating a Linux server? If the Goto Aliyun Not Finished! message is displayed, it means that the migration has failed. 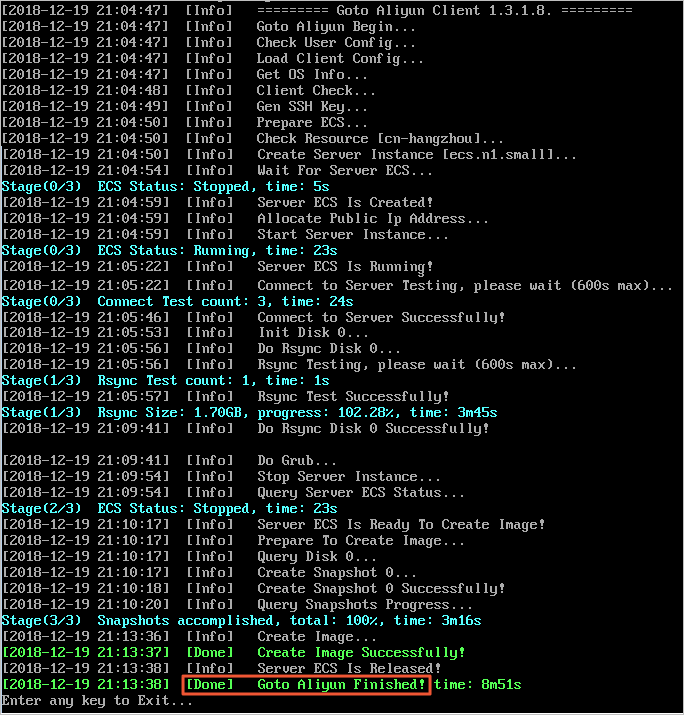 Check the error message in the log file of the Logs folder in the same directory, and then follow the instructions in Troubleshooting and Cloud Migration tool FAQ to fix the error. Note If the intermediate instance is released, a new migration is required. For more information, see What do I do if I released an intermediate instance by mistake? and When do I need to clear the client_data file?